By summer, Cass had agreed to a new five-year deal with the Lobos that boosted his salary from $181,000 to $210,000, with $10,000 incremental raises for each year after. This came on the heels of successive five-figure raises Cass received in 2012 and 2013, during which time the department was struggling to stay in the black. In November 2015, just months after his latest raise, Cass abruptly announced that he would be leaving UNM for the United States Tennis Association, to serve as general manager of its National Campus in Orlando. Although the move was something of a Volte-face, it coincided with Krebs accepting a new four-year contract. It had been presumed, among department denizens, that Cass would take over as AD after Krebs’s previous deal ran out. The revelation incurred righteous anger from local observers, both inside and outside the university, who saw this as nothing more than a deficit-ridden department giving a golden handshake to a favored insider. Now, NMFishbowl.com has learned that Cass’s deal is actually sweeter (for him) than previously reported: because of the way in which he was retained, as a part-time employee with a 36 percent appointment, Cass has been able to continue earning the same state retirement credits towards his pension. Through a public records request, we recently obtained a copy of Cass’s contribution history with the New Mexico Education Retirement Board. By applying the board’s formulas, NMFishbowl.com has determined that the consulting gig will increase Cass’s annual retirement pay from $71,618.73 — had he simply ceased accumulating credits after December 2015 — to $79,188.45. The compounding impact of that $7,500 yearly spike is significant: it means that if Cass just lives an average life expectancy (78.7 years), his additional pension earnings will reach $150,000. New Mexico public education employees are entitled to receive their retirement benefits, without penalty, when they turn 60. As it presently stands, the 52-year-old Cass will be able to earn his full pension slightly earlier, due to the aggregate of his age and his total retirement credits. While this matter gets into the superannuating weeds, it has caused something of a stir in the Athletic Department. Over the last month, a number of sources — and some anonymous tipsters — have reached out to NMFishbowl.com to raise flags about Cass’s pension. While UNM Athletics certainly has bigger financial drains at the moment, the consternation reflects a deeper misgiving about the way a cash-starved department spends its money. In a statement, an Athletic Department spokesman defended Cass’s role with the university while putting the onus of his deal elsewhere — namely, on UNM’s Human Resources Department and the NMERB. In response, the retirement board sought to clarify its place in the pecking order. “We did not tell UNM how to treat him, but we agreed with how they decided to treat him,” Executive Director Jan Goodwin told NMFishbowl.com. Actually, Cass’s position is rather unique: of the 10,539 employees currently listed in UNM’s online “sunshine” database, only nine carry the title of “professional consultant”. 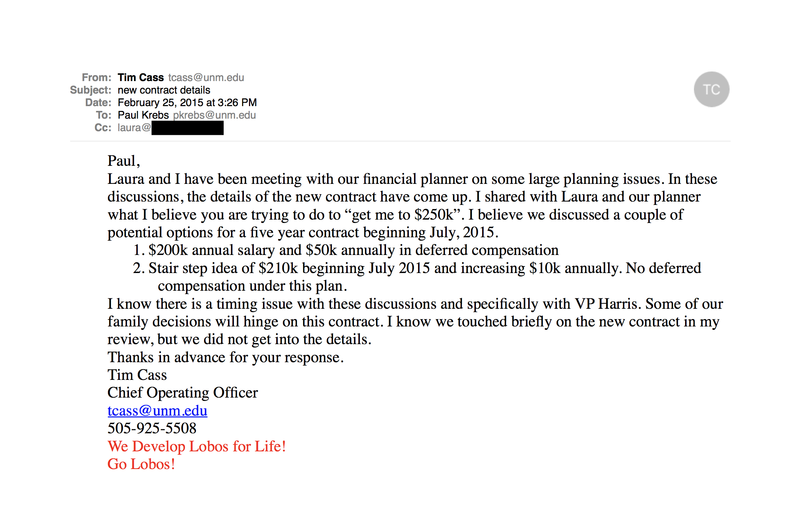 In a November 24, 2015 memo sent to UNM’s HR department, Krebs specifically requested that Cass be hired as a “.36 FTE” — the equivalent of 36 percent (or 14.4 hours/week) of a full-time employee’s schedule. That distinction enabled Cass to clear the retirement-earning threshold. According to the NMERB’s rules, any employee who is at least .26 FTE (10 hours/week), must be included in the pension program. It is impossible to independently confirm how many hours Cass is actually on the clock for UNM. Moreover, because he was hired as an “exempt” employee, his work schedule is given flexibility. Prior to leaving UNM, Cass, a one-time Lobo tennis player and coach, had been working to create a professional tennis management master’s program in the school’s College of Education. Bringing this to fruition was one of the key reasons Krebs cited for why Cass should be hired as a consultant. John Barnes, a UNM sports administration professor spearheading the curriculum, said the tennis management program is slated to launch in the fall 2018. UNM will be one of only three schools, along with San Diego State and Central Florida, to offer a sports management master’s with a tennis concentration. It’s only natural, then, to question why UNM, a school facing massive state-funding cuts, really needs to be part of such an exotic graduate school program. Because Cass wanted it? The USTA is in charge of certifying the tennis management programs, and works with the schools to develop their curriculum. While Cass said this work is handled by another arm of the organization, and “doesn’t fall under my daily watch,” the effort still yields an impression that he is being paid by two partnering entities — a private company and a public institution — for the same endeavor. The bigger lingering question is whether UNM should be paying him at all. Recently, at Cass’s invitation, the UNM Foundation and Alumni Association hosted a fundraising event at the USTA. UNM Executive Vice President David Harris, arguably the most powerful figure at the university, praised Cass in a keynote speech to donors. “I was invited to give the address at the event and did mention in my remarks that Tim had been an effective fund raiser during the time that he was Senior Associate Athletic Director,” Harris told NMFishbowl.com in an email. The cross-country gathering was something of an eyebrow-raiser: a tennis campus in Orlando is not exactly the most natural place to bring donors for the University of New Mexico. To curious insiders, the gathering was a sign that Cass may still be in line to eventually succeed Krebs as Athletic Director. When asked if he harbored those desires, Cass was demure. While Cass might have certain UNM friends in high places, he has also fomented a quorum of critics in and around the Athletic Department. To them, Cass has perpetually gotten the better end of the deal with the university. They argue he rose through the administrative ranks (and climbed the pay grades) chiefly because of his personal ties to Sonnet and Ian McKinnon, prominent UNM boosters who recently donated $7.5 million to the school. At the same time, they note, Cass presided over the department’s pursestrings during an era of insolvency. There also remains substantial unease about the complete exoneration of Cass in the Cody Hopkins scandal, and the timing of his acceptance of the USTA job in November 2015. A month and a half later, UNM announced that it was conducting an internal investigation of Hopkins, the men’s basketball operations director, over his use of a school-issued purchasing card. A UNM audit would eventually claim Hopkins had failed to properly account for $64,000 in charges and cash withdrawals. While calling it an “isolated” incident of fraud, UNM also issued formal reprimands to three other UNM employees, including one outside the Athletic Department, for failures of oversight. And yet Cass, who was Hopkins’ department supervisor, went completely unadmonished by the school. According to UNM policy, as a term appointment employee, Cass is not eligible to have his contract extended. His consulting deal is due to expire in January 2018, 10 months before the tennis management graduate course program is slated to begin.